Shalinee in India | Pursuit of beauty in everything Indian or ethnic. Pursuit of beauty in everything Indian or ethnic. Of late, I have taken a small fascination to saris. Actually, I used to wear them twice a week during my days at the university. During that time, I didn’t give saris any thought, for me they were a burden because they would take up a lot of precious time, after which I wouldn’t look near as elegant as I should have. Amongst the challenges of wearing a saree is managing the pleats at the front. There would be a weird bump around my midriff, where I would manage to have the pleats all bunched together. Happy Halloween!!! 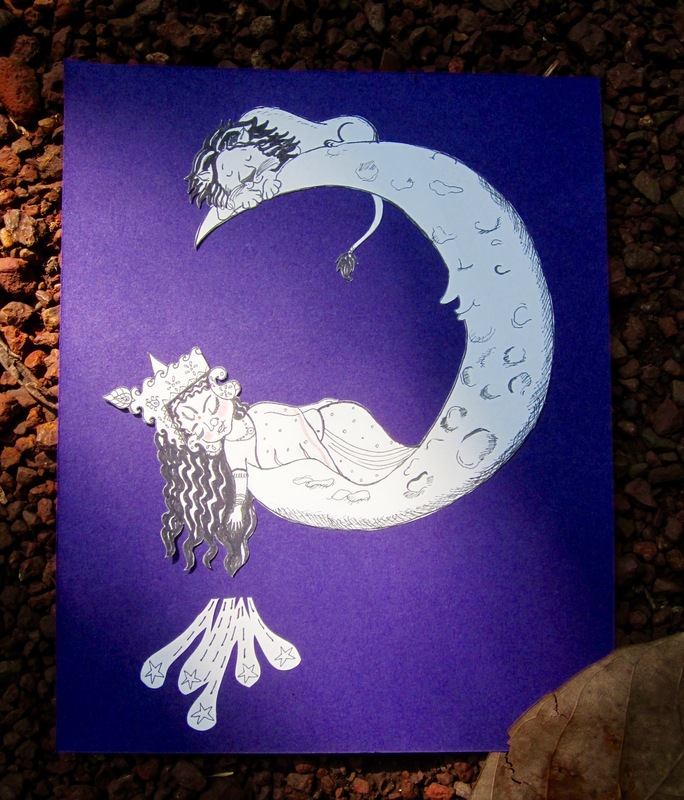 For all lovers of Halloween art, here’s a papercut I made about two years ago. A wizard with a telescope, some bats, pumpkins, this picture is screaming Halloween all over! If you wish to see another of my Halloween papercut, click here . The month of October is always about going into the forest and looking for beautiful and delicate mushrooms. I love the fallen leaves strewn all over the forest grounds, the red tinge everywhere you look, and peeking out of the nooks of the ground are mushrooms of all varieties. I think I could just weave a story out of this mushroom.. These dainty mushrooms go very well with the majestic chatêau behind them. I know not any names of mushroom varieties, and I am quite aware of how dangerous it could get eating wild mushrooms so I leave the tasting to our little animal friends. Sadly, this year there has hardly been any mushrooms in the forest. I was so disappointed!! All of these pics have been taken by me last October. I truly hope to see them back again next year! Actually, I am so glad that Halloween this year has kicked off so well here in France. I don’t think I have ever seen so many Halloween costumes being worn by kids or adults in any of the past years! Here’s my magical young wizard boy, busy checking the constellations, peering into the Halloween of 2017.. If you like my art and want to support it, buy my art prints or templates at Etsy, or forward it to someone you think might enjoy it! Cheers! Halloween is sneaking in closely! It’s time to be thinking of scary pumpkin heads, witches on brooms, bats and other ghouls. Here is something fun and cute that I’ve made. Always a big fan of cat art, here’s my Halloween Kitty, framed in a box frame so that the shadows can be enjoyed. This Halloween Kitty has been hand drawn and hand cut. Would you like to have this design, and cut it out yourself? Yes you can! 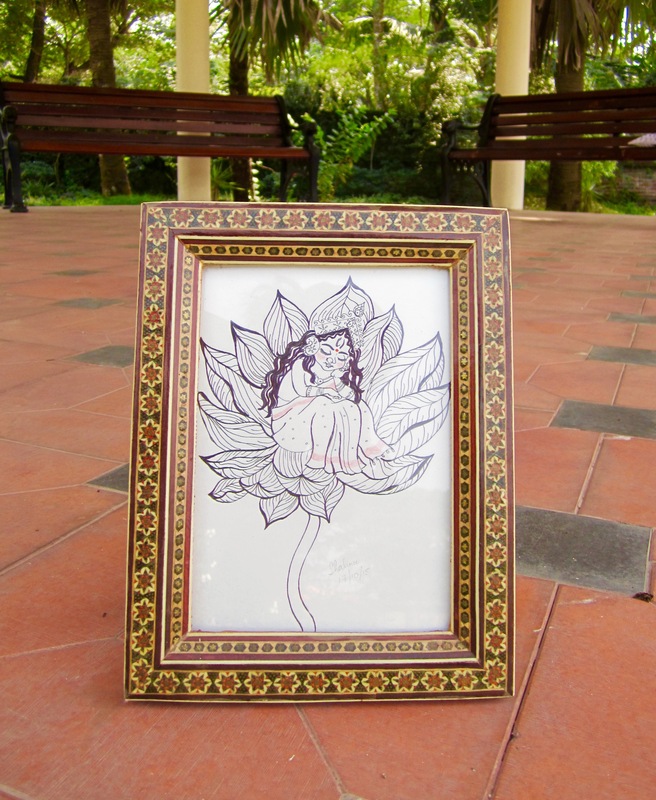 This art is available as a template, all you need to do is take a print out, get ready with your scalpel and cut away! You too can put it in a shadow box, or just stick it to cardstock and give it to someone special on the day of Halloween! Here she is before I spray painted her black. Do you like it black or white? Look at this gorgeous castle below… It’s deserted for many years… Haunted? I think so! Such deserted castles or old monuments can be found plenty around France. My husband and I, while on a stroll, found this beauty somewhere around L’isle Adam, an elite French neighborhood, 30 kms north east of Paris. Alas! The secrets of this castle are only enjoyed by squatters now..
A piano that has seen much better days. I can imagine this foyer at one time a resplendant place, welcoming, warm, and people walking to and fro the different rooms. This staircase walked up and down by an absent minded homemaker, realizing too late that it’s raining and the windows upstairs need to be shut.. I hope you enjoy looking down staircases as much as I do..
What is this cage like structure? A medieval torture device? Nooo…. Any guesses? It’s for holding wine bottles. Whew! Am I glad it’s a sunny day out! Shakes away some of the cobwebs in my head! Whoops, a skeleton car just pulls in!! Nah, just joking! This hilarious car advert is something I had seen at the Shiphol Airport in Amsterdam. Have you been totally spooked out by the haunted castle? If you want to read something similar, click here, of a trip into a haunted and deserted hotel I walked into, in Darjeeling, India. If you like my art and want to support it, buy my art prints or templates at Etsy, or forward it to someone you think might enjoy it! Here is Goddess Durga, beloved to Bengalis of India. Every October has a week long celebration dedicated to her. Here are some simple and quick sketches I had made in 2015, depicting her as a young girl. 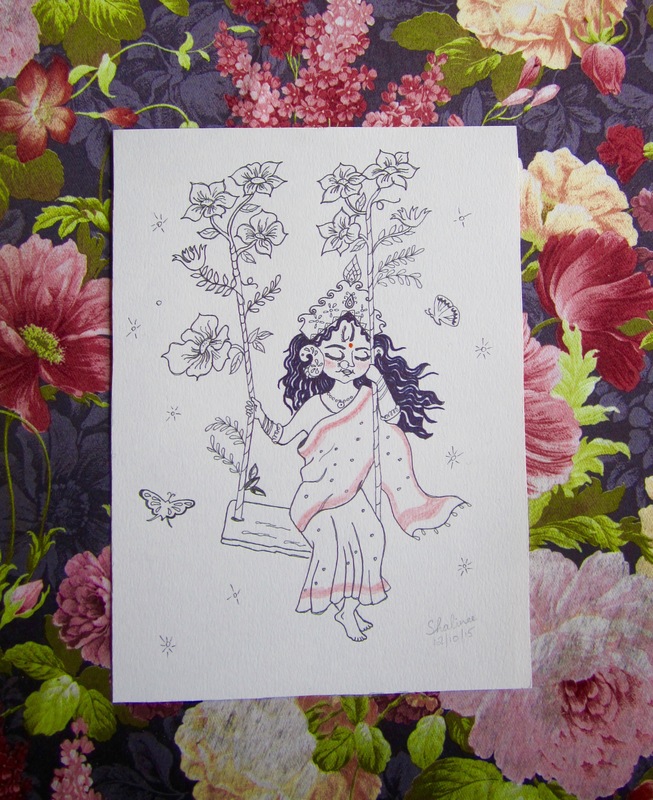 In this sketch above, I have her holding a Shiuli flower, a delicately shaped, small and fragrant flower. The shiuli plant starts to flower around October in India, hence this flower is strongly associated with the celebrations of Goddess Durga. 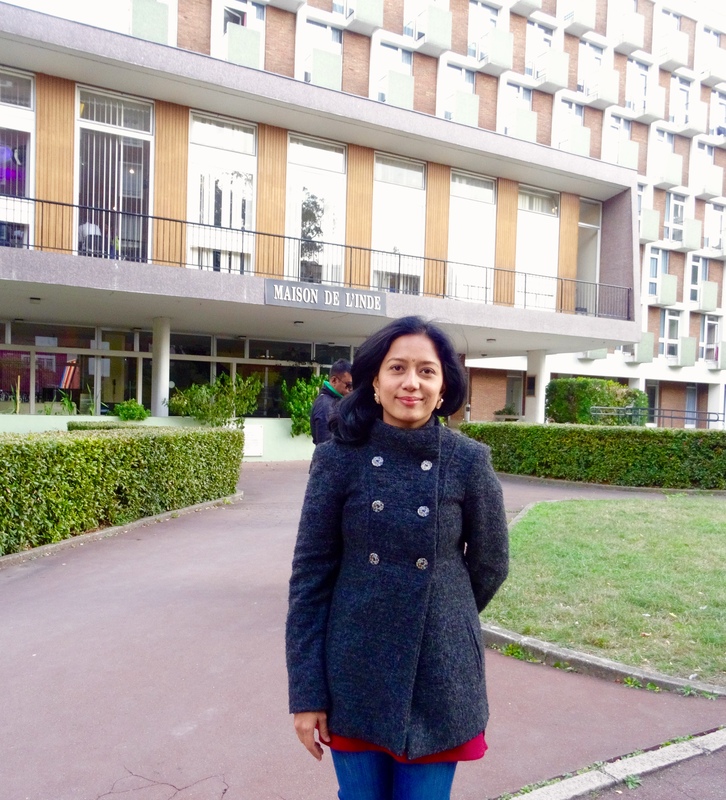 Today I attended the seventh day of the Durga Puja celebrations in Maison de l’Inde, located within the campus grounds of Cité Université, in Paris. If you walk inside, and walk up the first floor, you enter a big room where the celebrations are held year after year in this very room. 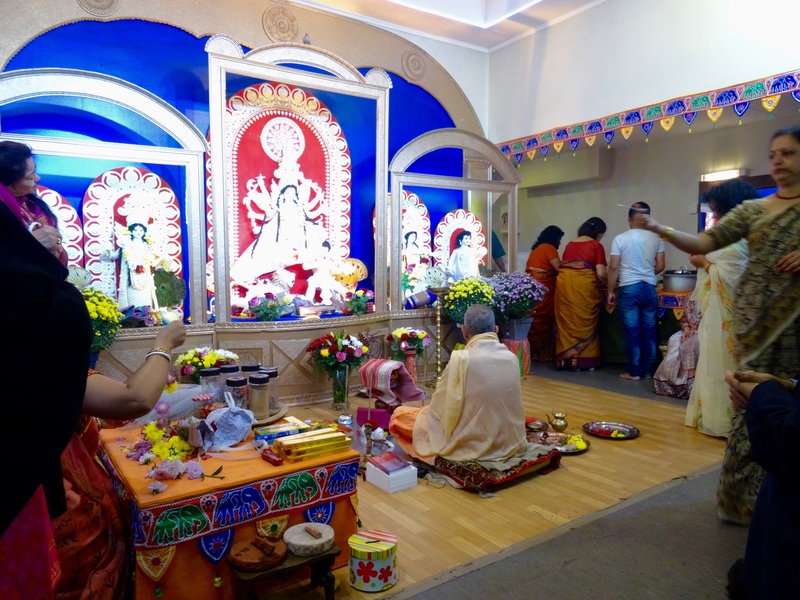 I asked some of the senior Bengalis around the room how long has Durga Puja been celebrated in Paris? ‘Since the last 30 years’ I receive the reply. 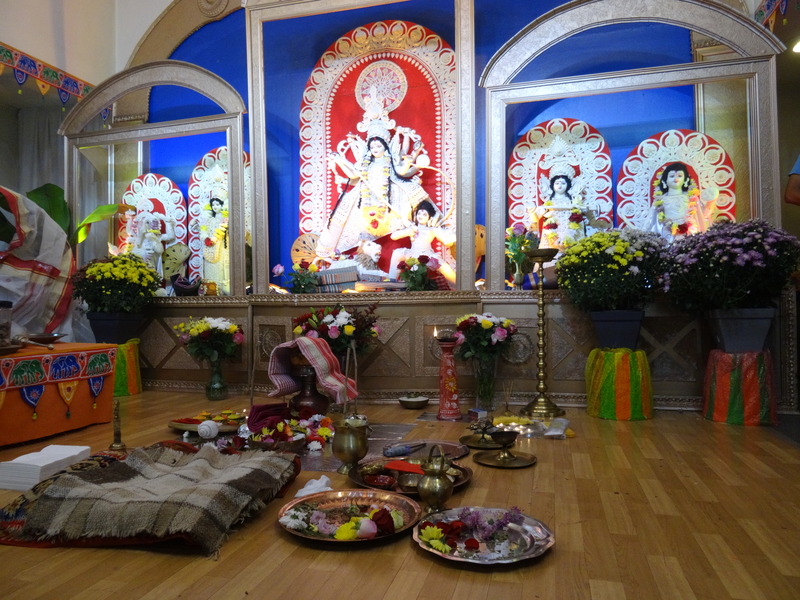 I can tell you that the ladies you see seated close to the idols, wearing saris, these ladies work hard year after year to produce equally beautiful, and as authentic Durga Pujas as Bengalis have it back home. They constantly move around making sure everyone is OK and enjoying themselves. One more thing : ANYONE can enter this place for free. There is no charge, or any kind of obligation to pay. 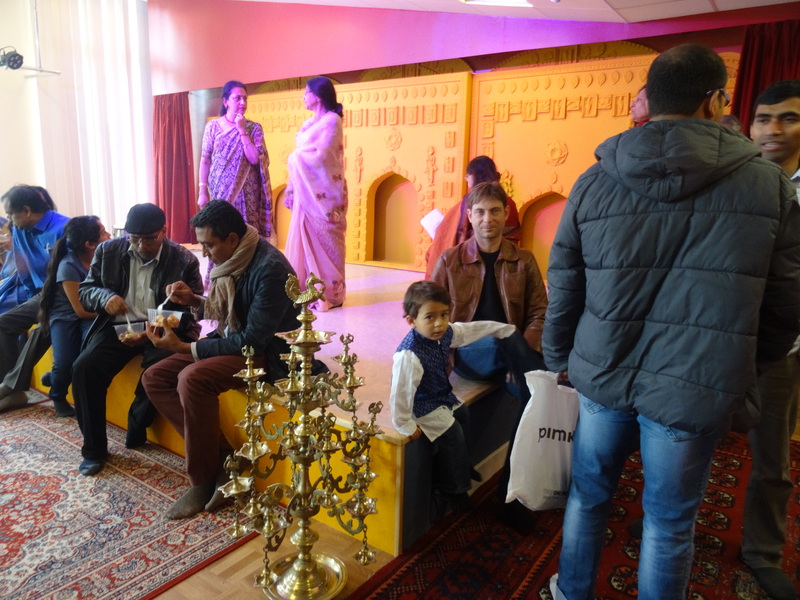 I see many curious visitors, French and other nationalities coming in here, and usually enjoying themselves, admiring the colorful saris, and the relaxed atmosphere. In the evenings, there are usually traditional dances, or Bengali songs sung, that lend to a very cultural atmosphere. Nom Nom! 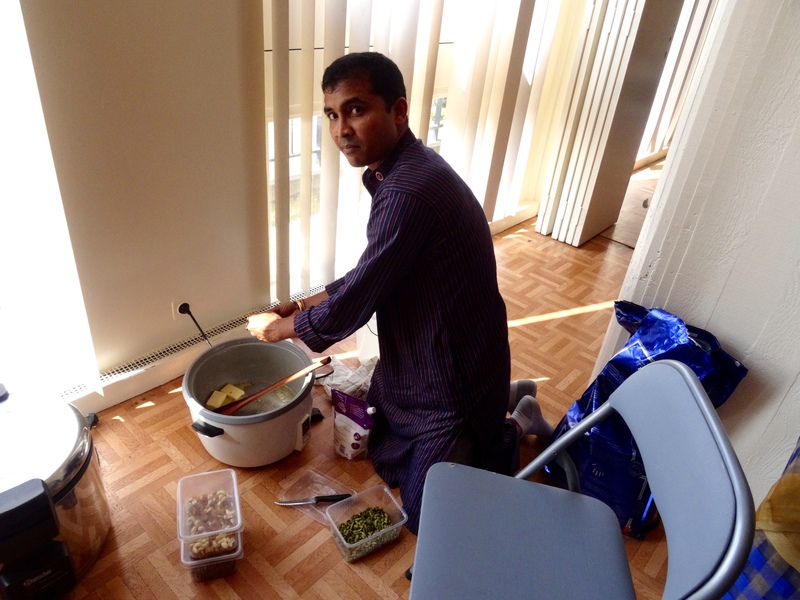 This is called ‘bhog’. It’s not the name of a recipe. It’s the term used for food that is prepared for lunch time, during the days of Durga Puja, at the place of worship itself. Here at the Maison de l’Inde, yes, ANYONE can just come in and have this plate of heaven. 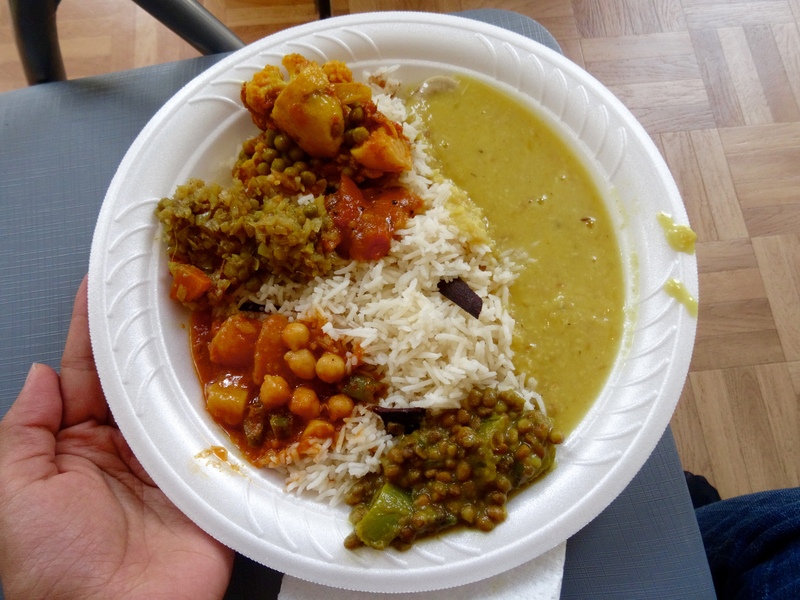 Bhog is always vegetarian food. 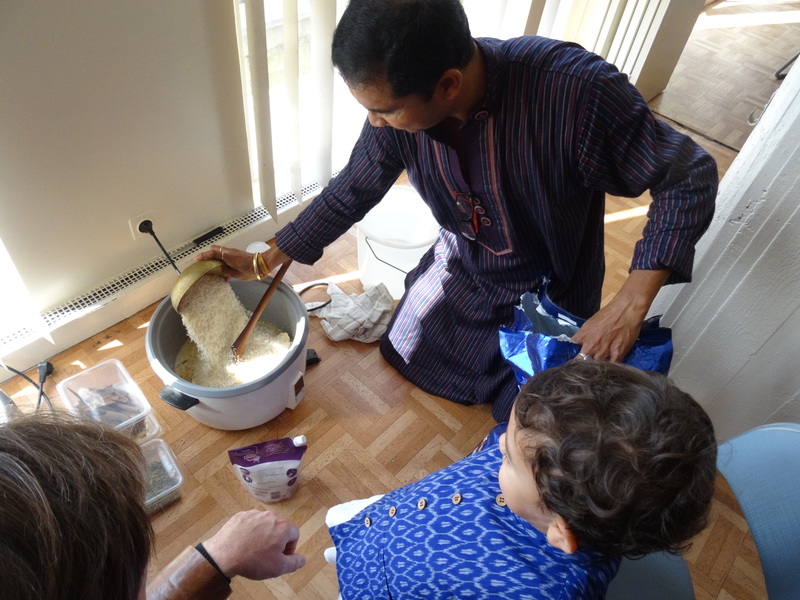 Rice, butter, sugar, salt, cinnamon, cardamom and rasins. And of course, finally add water that is double the quantity of rice, and shut the lid and let it cook about 15 minutes. Everyone busy eating the plastic containers distributed that had the cut fruits ( pieces of apple, banana, pomegranate, grapes, halwa) to everyone. Here is the Shiuli flower again, just making sure you remember that sweet little flower! 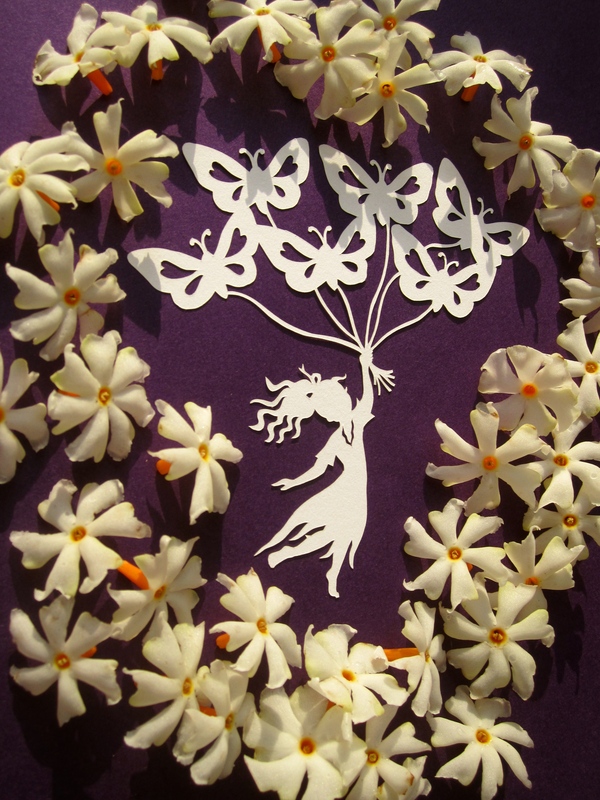 🙂 And here is my papercut Butterfly Girl, surrounded by shiulis. If you have liked this post, and would like to support my work, buy my art prints and framed papercut art at Etsy, or forward this post to someone you think would like it! Here’s a little artwork I had made yesterday. It is my little tribute to the great movie director, Satyajit Ray who had his birthday on May the 2nd. He was born 1921, and he received an Oscar award for lifetime achievement. 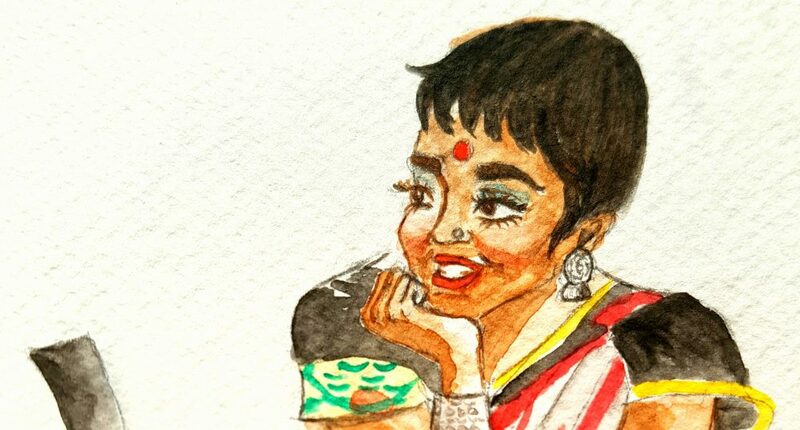 In this sketch, I have merged two of his best movies, Charulata and Mahanagar. Both have the actress Madhabi Mukherjee play a pivotal role. The dialogue is from Mahanagar, where Madhabi’s work colleague asks why she doesn’t use a red lipstick. 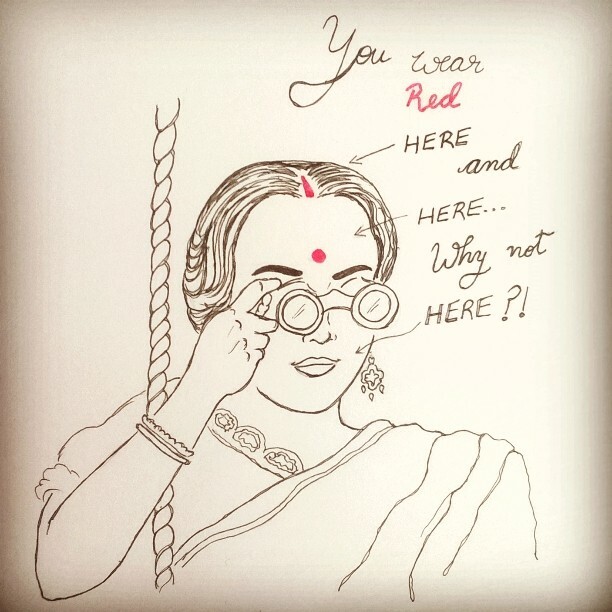 The visual is from Charulata, where Madhabi plays a lonely housewife who entertains herself by uses her binoculars to spy at people down the street.